There are several different options for getting the stump removed from your yard. To help you make a more informed decision, we’ve outlined a few of the most common approaches, and the pros and cons of each, below. Remember, always call #811 before you or your contractor attempt stump removal! It protects you, and it’s Colorado state law. While DIY can be awesome, DIY stump removal can get a little dicey. 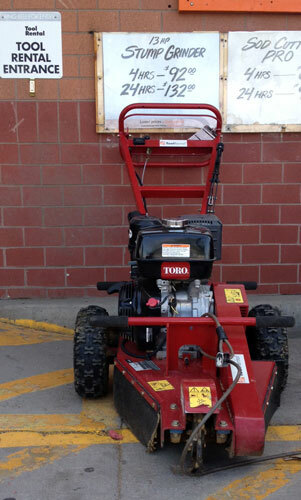 Renting a stump grinder from a local rental company, such as Home Depot or Sunbelt Rentals, will usually have a four hour minimum. Add in tax and a damage waiver (always a good idea since there is no way to know what is buried under, around or in a stump until the cutter head finds it for you) your minimum cost is about $110 (Home Depot) to $130 (Sunbelt). Some online DIY sites have instructions to drill holes in your stump and use chemicals to help your stump deteriorate very rapidly (6-8 weeks), then break it apart with an axe. In Colorado, because of our low humidity, chemicals often do not react and stay, crystallized, in the bottom of the drilled hole. If the chemicals do react, they can leach into the ground, killing nearby vegetation, and making revegetation nearly impossible without exchanging the soil. The warning label speaks for itself – keep your pets and children away from the area. Please don’t try this! A tragic story in Aurora reported the traumatic death of a man who was killed trying to pull a stump out of the ground with his SUV, also injuring his elderly neighbor. Takeaway: Some things are best left to professionals. Stump removal for many tree companies is often an “afterthought” service, something they have to offer to be considered a full-service company, but not something they are enthusiastic about. The operator may not be someone with experience and expertise, but may have just been assigned to grind stumps that day. Some companies wait until they have a group of stumps to remove and then rent a machine, resulting in delay for you. In any case, they will be more expensive. Cost: Flat rate written estimates based on stump size (not what we think you can pay) often 40-60% less than full-service tree companies, generally 10-25% less than other reputable stump services. Operator is a background checked professional, a Colorado native, and business owner. Stump removal carries an unconditional guarantee. Written scope of work and specifications before start of service. Flatirons is fully insured. A copy of our insurance is provided upon request. Flatirons Stump Removal is the highest rated, dedicated stump service located in and focused on the northwest Denver to Boulder area. By specializing in stump removal you get better service. By focusing on our local area, we are able to keep stump removal affordable by reducing travel time. Give yourself some peace of mind, cross that stump off your list (or your spouses list.) Our goal is to be one of your favorite companies, and we hope our professionalism and service will win your trust and referrals to your family, friends, neighbors and co-workers. Give us a call (or text) for a free estimate – 303-578-0822. If you discover, at any time, that your stump was not removed to the specifications on your invoice, we will return and remove any excess at no charge.